We would love to keep the Overberg a secret so as to preserve the serene ambiance of the area, but it’s just too good not to share. It has become such a popular add-on to our Garden Route Tours, that the team at 34º South Tours has listed the main reasons why you absolutely must add the Overberg to your travel experience or to your Garden Route Tour in South Africa. The Garden Route is truly one of the top travel destinations and highlights to experience on your holiday in South Africa. The route stretches along the picturesque south-eastern coastline, offering tremendous diversity and a scenic feast of experiences. South Africans have long ago discovered that half the fun is traveling to the Garden route and back. This is where the Overberg enters the picture. The meandering route through the beautiful scenery of the Overberg past the charming towns adds to the diverse scenic experiences you will already have encountered on your Garden route trip. Arniston (Waenshuiskrans) is 370 kilometres from Knysna on the Garden Route, making it the perfect “halfway station” back to Cape Town. It is an unforgettable break ensuring you arrive back in Cape Town refreshed and energised after the Garden Route leg of yout tour. The stunning turqoise/azure-coloured ocean at picturesque Arniston, an unexpected gem on our Garden Route and Overberg Tour, is one of the reasons why this quaint fishing village found its way into our hearts. The colour of the ocean is almost unreal and at the same time, both calming and invigorating. The 4-star Arniston Hotel is located right on the ocean. One of the joys of staying in this warm friendly hotel, is the ocean view from our beatiful sea-facing room, which is decorated in cool ocean colours. This may be a small charming fishing village, but the restaurant in Arniston Hotel is top-notch and serves a wide variety of sophisticated dishes and a delicious breakfast buffet that will tempt you to over-indulge. And if you love to be pampered, make sure to pre-book a spa treatment at the Ginkgo Spa at Arniston. Watching the Kassiesbaai fishermen with their friendly, weathered, crinckled faces bringing in the catch of the day, rates as one of the highlights when staying in Arniston. Stroll down to the small fishing harbour with its colourful fishing “chuckies” and watch as they expertly clean the catch of the day, which could be Cob, Red Roman, Steenbras or any of the other fish found in these waters. A large portion of their catch is bought by the Restaurant at Arniston Hotel, and the Chef starts his day selecting the fish and shellfish for the restaurants’s menu. So it really is the “Catch of the day”, fresh and delicious, when you order this on the “a la carte” menu. From Arniston Hotel, it’s an easy stroll to the beautiful safe beaches with its warm shallow water; the Waenhuiskrans beach cave that can be accessed at low tide and the pristine sand dunes that beckon to be conquered. Hermanus is the favourite annual holiday venue for the Southern Right whales from July to November. They travel yearly from Antarctica to mate and calve safely in the calm water of Walker Bay. This makes Hermanus the best land-based whale watching spot in the world during whale season (and the best people-watching spot for whales). Hermanus has the only Whale Crier in the world. The position is currently held by Eric Davalah, who followed in the footsteps of a progression of Whale criers since 1991. The Whale crier searches for whales alongside everyone else, strolling along the cliff paths, and announcing whale sightings by blowing on his kelp horn. It is such fun to be part of the collective sighs of enjoyment and amazement from the people as they spot a whale breaching. 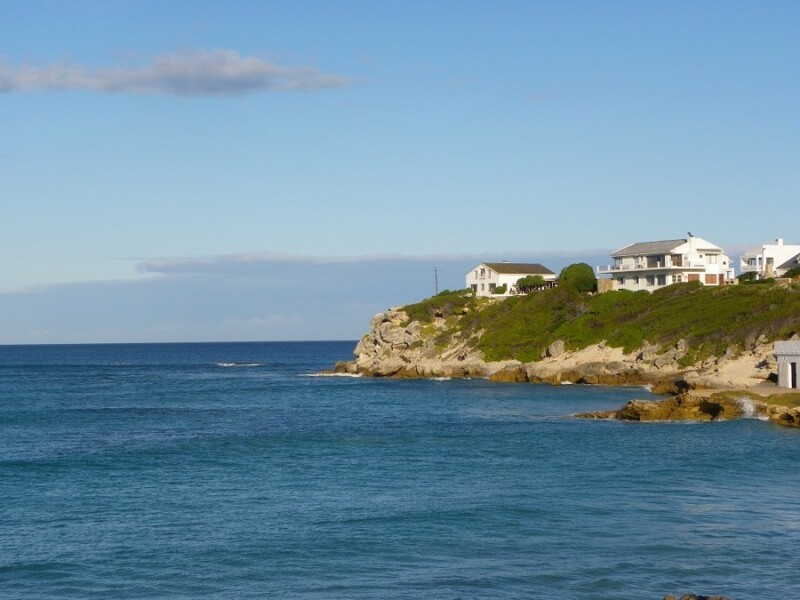 Hermanus is a favourite holiday venue with its pristine blue flag beaches. The Hermanus Wine Route along the Hemel-en-Aarde Vallei (translated meaning Heaven and Earth Valley) offers wonderful wine tasting and wine shopping experiences and includes the wine estates of La Vierge Wines, Sumaridge, Bouchard Finlayson and Hamilton Russell Vineyards. Fernkloof Nature Reserve provides stunning panoramic views and photographic opportunities overlooking the valley and ocean. It is not unusual to see Blue Cranes, South Africa’s elegant national bird, chatting to their sheep friends next to the farm roads. Almost half of South Africa’s Blue Crane population of about 25000 birds are found in the Overberg. As these stunning birds are under threat, seeing so many of them along the Overberg roads is a privelige we hope to continue enjoying in future. The only remaining colony of Cape Griffon Vultures in the Western Cape, live in the steep cliffs of the Potberg Mountains in the De Hoop Nature Reserve. They now flourish where their numbers were previousdly dwindling. The farmers and community have been instrumental in protecting the colony. Traveling in Cape Town’s direction, just before Clarence Drive, we stop at Stoney Point in Betty’s Bay and stroll along the wooden boardwalk to the controlled access point where, for a nominal entrance fee, one can observe the African Penguin Colony. We love their former name, the “jackass penguins”; this aptly links them to donkeys because of the braying sound they make . The adorable penguins, all dressed up in their “tuxedos”, must rate as one of the cutest birds we’ve ever seen. This is a wonderful opportunity to see them in their natural habitat, where they are not enclosed, and free to come and go as they please. They share their “home” with cormorants and many other sea birds. A jacket is advisable as the temperature can be cool with a strong wind. We love traveling along the back-roads that pass the farms in the Overberg. Away from the hustle and bustle, there’s time to stop and take pictures and to enjoy the views of the rolling farmlands and the beautiful scenery. During the late winter and early spring months, the magnificent bright yellow canola fields stretch as far as we can see. We tried to capture it on camera, but there’s nothing that comes close to seeing the bright-coloured fields “live”. Behind the rolling hills of the Overberg, the backdrop of rugged blue mountains makes a stunning picture and it is easy to see why they have inspired many South African songs. There’s something special and magical knowing we are standing on the southern-most tip of Africa, that iconic point on the African map. When we face the ocean, the Atlantic Ocean is on our right ; the indian Ocean on our left. This is the southern-most point that the early seafarers had to circum-navigate when they were searching for safe passage to the spice islands of the East. 12. Clarence Drive, our magnificent scenic coastal drive, is one of the most scenic roads you’ll experience. Clarence Drive is considered one of the most scenic drives in the world (as per our guests’ opinion) and the stunning scenic splendour entices you to stop at the viewpoints to try and capture the beauty with a photograph. The road is hugged snugly by the mountain range on one side and the ocean on the other. Whether it’s a sunny or cloudy day, the scenery is truly spectacular and we’ll never tire of dricing along this beautiful road. Instead of taking the shortest route to Cape Town, treat yourself and make the best detour to Greyton, a picturesque, qauint and arty village. One of our top favourite villages in the Overberg, Greyton it is best explored on foot in order to enjoy all the gems one can discover in this beautiful village. Keep your camera ready as there is ample photo opportunities. Our favourite activities in Greyton include shopping (art, candles, beauty products, gardening, fashion, gifts, chocolates, wine and much more) and hiking (whether through the village, in the Nature Reserve or along the river) and enjoying the delicious cuisine of the many quality restaurants. If you’re around on a Saturday, the Saturday Morning Market is where you would want to explore and buy wonderful arts and crafts and delicious edibles. Don’t be surprised if you don’t want to leave – Greyton is known to enchant and is a favourite wedding venue for a reason. All our private tours can be customised to include as much of the Overberg as you would like to explore ; we also include the Overberg in many of our small-group tours.